regional group to push through legislation. To carry on with reforms, the Congress party will have to rely on the support of the BSP to defeat the BJP. In Friday’s vote BSP lawmakers voted with the government, handing it a 123-109 victory. The UPA government won a second parliament vote on Friday on allowing foreign supermarkets into the country, paving the way to press ahead with more reforms, including freeing up a cash-strapped insurance sector. While the Rajya Sabha vote was symbolic, the government’s victory was a boost for its push to implement a controversial economic reform agenda seen as crucial to reviving growth and reducing a bloated fiscal deficit. The government had already won a vote on retail reform in the Lok Sabha two days earlier. The policy will allow global retailers such as Wal-Mart Stores Inc (WMT.N) to set up shop in the country’s $450 billion retail sector, and is aimed at drawing more overseas investment and taming inflation. Although both votes were non-binding, defeat would have piled pressure on govt. to roll back the measure. Overall, it is a positive development. More than anything else, it reaffirms the political will to start reforms. Once again, fragile coalition government relied on Friday on the outside support of the Bahujan Samaj Party (BSP), underscoring the extent to which it is at the mercy of powerful regional group to push through legislation. 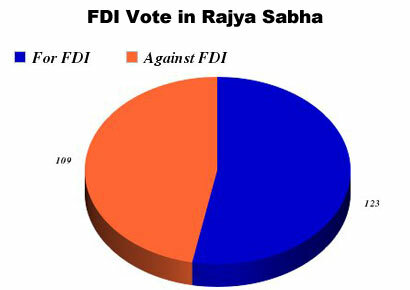 In the shrinking window before a general election due in just over a year, government wants to push reforms such as allowing more foreign investment in its insurance and pension sectors, and simplifying tax laws which has 10 days left before the end of the current parliament session to try to pass legislation. The reforms are on track, for the government would bring financial sector bills to parliament next week. To carry on with reforms, the Congress party will have to rely on the support of the BSP to defeat the BJP. The government also aims to pass a bill that paves the way for the Reserve Bank of India to issue new banking licences, as well as increase its regulatory powers over Indian banks. pricing philosophy under, which it price items at a low price everyday. The Company’s operates in three business segments: the Walmart U.S.
Wal-Mart Stores Inc when it went up in flames. when it went up in flames. no profits and a scant $14,000 in revenue. hypermarket chain Lenta by 2015 and would consider a buyer like U.S.
global head of private equity said. strong start to the holiday shopping season, data showed on Sunday. Like other states of India, Buddhism in Punjab is flourishing very fast. Bhikkhu Sangha is the main instrument for this noble work.